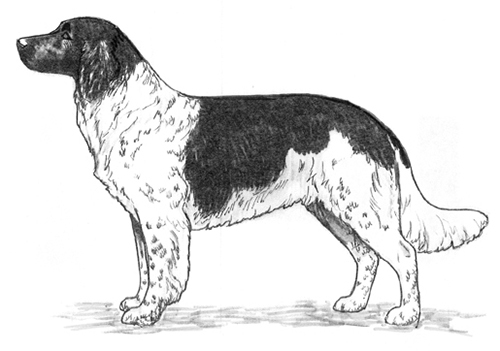 The Stabyhoun originated in the northeastern part of the Netherlands, probably descended from spaniels that were brought during the Spanish Occupation (1568-1648). The first written description of the breed dates back to the early 1800’s. It is a versatile breed, used on farms as both a hunter and a watchdog. The Stabyhoun was recognized by the United Kennel Club January 1, 1996. A balanced, sturdily built, long haired pointing dog that is rectangular in shape. A devoted, soft, gentle pet, intelligent and easy to train and a good guard dog. Dry, showing more length than width, with a skull and muzzle that are equal in length. The skull is slightly rounded, not narrow, yet not giving the impression of great width. It merges with slight rounding into the cheeks. There is a slight stop. Powerful, tapering gradually to the nose but not pointed. The bridge of the nose is straight and wide. The lips are tight and not pendulous. The Stabyhoun has a complete set of evenly spaced, white teeth meeting in a scissors bite. Well developed, with well opened nostrils, black or brown in color, depending on the color of the coat. Medium sized and round, with tight lids, set horizontally. Color is dark brown in black dogs, and brown in brown or orange dogs. Set fairly low and held close to the head without a fold at the base. Moderately long and shaped like a mason’s trowel. The feathering is long at the base of the ear, and decreases in length towards the tip, which is covered with short hair. The long coat must be straight or slightly wavy, never curly. Short, round, and slightly arched, carrying the head low. No dewlap. The shoulder blades are close, well laid back, and well angulated with the upper arm. Powerful and straight with upright pasterns. Powerful and rectangular in shape, with a rather long back. The chest is fairly broader than deep, so that the front legs are set well apart. The forechest is not well developed. The ribs are well rounded and long. The loin is powerful, and the croup is only slightly sloping. The belly is moderately tucked up. The hindquarters are powerful and well angulated. The lower thigh is not too long, and the hock is set low. Oval, with well arched toes and tough pads. Fairly low set and long, reaching to the hock. At rest carried downward, with the last third carried turned up in a gentle curve. In action, the tail is lifted but never curled. Long and smooth all over the body, may be slightly wavy over the croup only. The coat on the head is short. The backs of the legs are well furnished, but more bushy than feathered. Black, brown or orange, with white markings. Ticking or roaning in the white is permissible. Ideal height at the withers for males is 21 inches. For females, it is 19.5 inches.